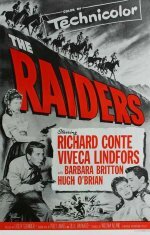 The Raiders in this case are a band of victimized gold miners who strike back at the organized ruthlessness of a land baron who also is effectively sabotaging a movement to unionize the California Territory. As the leader of the rebellious miners, galvanized into avenging his wife's murder, Mr. Conte conducts a successful crusade, generously punctuated with thundering hoofs and lusty gunplay, and barely escapes official hanging through the advent of statehood. And Miss Lindfors, as a smitten underground rider who develops an allergy to bloodshed, returns to claim him. Even within its well-trod rut, the film is not without persuasiveness. Both Mr. Conte and Miss Lindfors, in two of their most hand-me-down assignments, are quite convincing. So, too, are the others, particularly Hugh O'Brian, Richard Martin, William Bishop, Morris Ankrum and Barbara Britton. And Lesley Selander, the director, has balanced the vigor of the skirmishes with some nice understatement in the quieter scenes.